According to Anthony’s Blog spawn page, he now knows who I am and is considering whether to release or not. He also adds, see about page, which links to my about page. I’m not quite sure why he’s said that. Is he thinking I might simply decide to announce it myself? I don’t know if he does know who I am. He certainly seems to have a habit of working these things out, having recently outed Sou and others in the past. Maybe he’s made a lucky guess? Maybe I’ve slipped up somewhere? If I have, I don’t yet know where. Apart from my family, I’ve told 5 other people, so maybe it’s a 6 degrees of separation thing, but I’m sure one of them would have mentioned knowing Anthony Watts. Apart from that, I know I mentioned my name in one DM on Twitter, and maybe it’s mentioned in an email or two. Anyway, I certainly wouldn’t ask Anthony not to release it. I’d rather he didn’t, but I’ll let him decide whether he thinks it’s right to do so or not. I can’t imagine he’s terribly happy with me or my blog, but I have offered – the only time we ever communicated – to apologise and correct any personal attacks if I’ve made any. That offer still stands and, as with everyone else, he’s welcome to correct anything I’ve said that he thinks is wrong and can demonstrate to be wrong. I don’t think I have made any personal attacks, as that isn’t my intent, but I have written a lot, so can’t claim to have never said anything poorly. I appreciate that some think that the blog name, in itself, is a personal attack, but I don’t agree and Anthony’s never directly indicated that to me. He even highlights it on his blog spawn page. I should add that if I were to start making personal attacks on people (not that I want to), Anthony wouldn’t be my first choice anyway. There are numerous other people who (at least with respect to how they’ve treated me) are more deserving of it than Anthony. Anyway, I have no real intention of outing myself just to beat Anthony to it. I’d want to give it a bit more thought before doing so, and can’t really see any particular advantage to not being anonymous. Others my disagree and already have. I had considered trying to keep this blogging going for a year (it’s been just over 8 months) and then, depending on how things are going at that stage, either out myself, or wind things down. Of course, an interesting issue is what I should do if Anthony does indeed know who I am and does decide to release it (what might be more interesting is if he decide to release it, but doesn’t actually know who I am :-)). Do I stick with it as is? Do I change the blog name and move on (in terms of posts, that’s kind of happening anyway)? Do I feel that I’ve done enough and simply wind it down? I don’t know the answer myself. Will just have to cross that bridge if and when it happens. This entry was posted in Anthony Watts, Watts Up With That and tagged Anonymity, Anonymous, Anthony Watts, Blog spawn. Bookmark the permalink. If you are outed, prepare for personal attacks – by email or on Facebook – or to your employer or other social groups. It comes with the territory. Call his bluff. Or rather, ignore it. Either he’s playing games or he’s not and he has your ID. If the latter, nothing you can do about it. If the former, you win. I’ve always thought the anonymity was a good thing. It shouldn’t matter who you are just what you say. But the thought of Anthony Watts disclosing your identity against your wishes is infuriating and I don’t think he will necessarily respect your wishes. That would require a level of integrity which I just don’t see from him and he hasn’t respected the wishes of other people who have also wanted to remain anonymous. So I think you should out yourself just to prevent him from having the last say on this. But as you say, he may have guessed incorrectly. John, indeed. That’s my main reason for being anonymous. It does appear as though things can get very personal. BBD, that’s my intention. If he knows, he knows. Nothing I can do about that now. If AW *does* know who you are, you will need to find out how he breached your anonymity. Specifically, if you were hacked. Perhaps you have a colleague in the CS department who might inspect your system. This would be my next step. Interesting things can happen at this point. Watts has a very serious pathology about wanting to out posters who use a nom-de-plume, pseudonym, alias. Years ago I posted a few times there, using my hotmail account [which holds my name]. To one critical comment [the Bush doctrine is rife there], he replied with my name in the address. The guy as said has a serious pathology, fodder for psychologist. The number of times he’s posted Tamino’s name… you’d probably need all fingers on 2 hands to get a count. BTW, follow the money… he’s documented to be funded via Heartland [IIRC]. Not a mind of his own that’s for sure. Let’s correct that. His desire to “out” posters applies only to those that disagree with him about climate science. He has a similarly selective reasoning that he applies to attributing “cowardice” to anonymous commenters. Those who are anonymous and disagree with him on the science are “cowards.” Those who are anonymous and agree with him on the science are not. And with respect to that last issue – Watts reverse engineered from my email address to make accusations about me commenting on the web while on the taxpayers’ dime. When I pointed out that his accusation was inaccurate, and offered to prove it, he put me into “moderation.” Ironically, that seemed rather cowardly to me. As for the ethics of “outing” people, Mosher took it upon himself to post my full name without asking me first whether or not I objected. In fact, I didn’t care, but I do consider it meaningful that he took no heed of the possibility that in posting my full name, he might have negatively affected my life. I have no idea how Mosher determined my full name. I wonder whether he may have gotten information from Watts about my email address and thus deduced my full name. Or, being technically skilled, he may used some other methodology. Either way, I find it pretty creepy that people who are ostensibly interested in the integrity of science would spend their time making the effort to “out” people. Sad state of affairs, the climate wars. Indeed, very sad state of affairs. Creepy is an understatement. If someone has gone to the trouble of hacking emails – and they’ve done this in the past – then it’s beyond creepy. It’s illegal, dishonest and quite disturbing. Felt that was a “goes without saying”. Would be even worse psychologists case if outing those agreeing with him. I have no idea how Mosher determined my full name. It’s pretty pathetic. Or completely pathetic even. What difference does knowing your identity actually have to anyone (apart from idle curiosity)? I guess there might be an argument for it if there was a suggestion that what information you have given about yourself is false and/or you had some undeclared connection with the climate science community but I see no reason to think that. Anyway, even if he does reveal your identity I don’t see any reason to stop blogging anonymously. Sou still does so and Tamino and Eli’s real names are well known. Anyway I hope it doesn’t discourage you from continuing – you’ve managed to create a good blog with its own identity and good mix of followers. Andrew, thanks. That is certainly on option. Just keep going regardless. As you say, seems to have worked perfectly well for others. Hopefully you haven’t commented anywhere unfriendly; that leaks your IP address. It’s a vicious double standard, because Steven Goddard, who used to post on WUWT all the time, is a pseudonym. Watts has often allowed anonymous people to post on WUWT, but he loves outing any anonymous people that he views as enemies. Being ‘outed’ isn’t the worst thing. You’ll obviously be subjected to more personal attacks, but usually it won’t impact your personal life, unless you’re sufficiently high profile. I wasn’t subjected to any significant personal attacks until I started posting on The Guardian. Unfortunately that’s changed recently, and it has impacted my personal life a few times, but it’s not the end of the world. In any case, Watts is so frequently wrong that I wouldn’t be at all surprised if he’s misidentified you. William, that’s already happened, so I think they know where I am. Not sure if that’s enough to know who I am, but maybe it is. Dana, it is rather a double standard. Maybe this is related to the spat I had with Steven Goddard on Twitter last night 🙂 (yes, everyone, I know I said I’d stop – it’s just that people keep saying things that are wrong ;-)) I’m certainly not high profile, so hopefully that will help if I am outed. In principle, not too worried about it but don’t particularly look forward to having to deal with additional unpleasantness, were it to happen. It’s all downhill from here, Wotts. Twitter is a portmanteau – tittering for twats. To William’s point, I make it a point of never commenting from my place of work or home on an “hostile” site. By hostile, I mean one that is more interested in “winning a debate” than discussing the truth. Also, since you can detect IP addresses of visitors as well, I make it a point to not follow any pattern when perusing unfriendly sites (e.g., always showing up at the same time on a hostile site or posting elsewhere on the internet or Twitter at a time that can be matched to a visit on a hostile site). I’m not prolific on climate science as you are, but follow this rule carefully where I am prolific and where similar hostile environments exist (e.g., creationism, religious fundamentalism). Bobby, I don’t comment much on “hostile” sites, largely for the reason you say. However, it seems as though something is known of me, which is probably from one of my rare comments on one of those sites. Like as not he’s got your .ac.uk which only means he can narrow it down to institution and department. Unless there’s only you – which I imagine is unlikely – he shouldn’t have enough to go on to identify you personally. BBD, that was my impression. I don’t think a process of elimination would work, but maybe he’s incredibly determined. It’s my view that if he says he knows, he really does know. And also not exactly what I would see as conservative, Christian family values. It would be nice if conservatives and Christians would value their values and would shun such people. Take this as an opportunity to move on, if it comes. Watts is worthless and your blog deserves to be far more than a nomenclatural shadow of his. Rachel, maybe. However, if he really does know and it’s not an educated guess, then that would imply access to information that was not public. At least, I’m unaware of any way he could actually “know” without this being true. To gain web anonymity, if you value to be much less traceable: http://www.webupd8.org/2013/12/tor-browser-bundle-ubuntu-ppa.html . OPatrick, thanks. I have considered that and may indeed be the best way to go. What BBD said. If some mendacious lying scumbag wants to prove how pointlessly childish he can be, who cares? We don’t, and I’m sure you agree that our good opinion is worth far more than a lying mendacious scumbag who hates science. I found out who you are quickly and easily by using Google. I won’t say how except that I relied solely on your blog and Twitter output. (E-mail me if you want the details. I don’t check my Yahoo e-mail account very often so don’t hold your breath. Also don’t hold your breath expecting anything astonishing. It was really very simple, I’m afraid.) I searched because I like puzzles, that’s all. I wouldn’t out you. 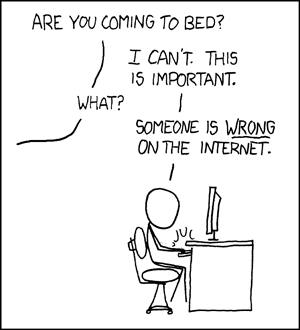 There are good arguments for and against anonymity/pseudonymity online. The most powerful against-argument is probably that anonymity is ill-mannered. Annoyed by people who wear sunglasses indoors? Me too. It gives them an advantage because they can see your eyes and you can’t see theirs. You are not communicating as equals. One of you is being himself; the other is being Bono, not a conversationalist but a solipsist transmitting precious bulletins from behind a protective screen. But there are good for-arguments, too. Mine are looking a bit threadbare these days but yours might be better, so don’t let yourself be bullied into outing yourself. If being thought a Bono isn’t too high a price to pay, stick with it. The NSA knows your identity. Then it is just a matter of someone’s willingness to pay. Or is there someone expecting that all their employees are incorruptible? guthrie – “lying mendacious scumbag” – blimey – keeping it civil ? I’d hate to hear you being rude! Vinny, seriously you actually know my name? Surely you mean that you think you’ve guessed who I am, or are you suggesting that you actually have found something that is definitive? VTG, yes the “lying, mendacious, scumbag” did worry me a little but I’ll let in go in that it was implicit, rather than explicit (i.e., it is of course true that I value your opinions than those of a lying mendacious scumbag). I’ve been trying to find a cartoon (which may have been in private eye) that is of a couple, both of whom are working on laptops. The husband turns to the wife and says something like “I’ve just come across some moronic idiot making stupid statements on the web”, to which the wife responds “me too”. Wotts, strong circumstantial evidence, not definitive proof. Let me elaborate – I think it clear that a number of people are basically beyond the pale, and trying to be nice about absolutely everyone including such people, no matter how nasty and wrong they are, is, unless you are a special kind of person, very wearing and generally a waste of time. I reached my limit a few years ago, I now call idiots idiots and feel much better for it. Of course i also prove that they are idiots, but the point is that just being nice to everyone all the time is a limited strategy that I don’t think gains you anything in the long run. I also distinguish being nasty to people in person and about them, although that’s maybe a bit odd of me. I probably wouldn’t call Antony such names to his face, unless I felt he deserved it for his recent behaviour. On the other hand this is your blog so I’ll try avoiding saying too many nasty things. Vinny, the Bench would laugh at that. It is unfortunate that anyone should feel the need to be anonymous, but it is understandable for people who want to limit the infiltration of climate-war noise into their professional and family lives. I do think that signing a real name to an opinion adds some credibility, though. Rachel says that we should be able to evaluate an opinion without knowing where it is coming from, which is true in an idealistic sense, but I always have an urge to want to know who I am talking to and what their background is. If Watts does out you, it is probably still worth maintaining a pseudonym. At least it won’t show up in Google searches, when people look up your real name. Richard Tol, I have noticed, sometimes refers to you by a first name. I have no idea whether he knows your real name and is just being a tease, or whether he has made a wild guess and is fishing for a response. I would, anyway, encourage you to change your blog name and Twitter ID. This is a fine blog with a dreadful name. Yup. Me too. Life’s too short, and besides, people take advantage. Guthrie, thanks. I’m slowly getting there myself to be honest. What stops me (mostly) is the sense that I don’t want to drop to their level. The other thing is that you then open yourself up to the “apologise or else” type discussion, which I really can’t deal with. He’s fishing. He even switched between he and she for a while. I quite liked the thought that maybe I was writing in a gender neutral way, but I suspect he was also just fishing there too. More reasonable people are suggesting this, so I may well go ahead and do that anyway. Will certainly give it some more thought. > The most powerful against-argument is probably that anonymity is ill-mannered. Second, the usage of a pseudonym is not a “manner”, and therefore might not considered “ill-mannered”. A persona, even beyond masked balls, only carries for voices and acts. AW will probably claim a victory if you change the blog name, but that would be self-serving tripe. All things considered, perhaps a name-change would be a good idea. As you and others have pointed out, your blog has outgrown its name. I think I’m starting to agree that perhaps a new blog name is in order, especially if it means we don’t have to call you Wotts anymore. So long as you don’t call it “Civil Climate” because when your Twitter habit eventually and inevitably engulfs you and you cease to moderate here and it turns into Deltoid 2, people will snigger. Yes to new blog name, as others have noted. While I have nothing against debunk-WUWT sites, for a good while I ignored this one under the assumption that was the primary focus. Okay, I think everyone has convinced me. Watch this space (or some space). How about calling it Boshop Hill? Evidence please. There are plenty of ill-mannered folks in the blogosphere who use their real name. There are plenty of pleasantly-mannered people who don’t. Is there some balance there whereby folks using pseudonyms are more likely to be ill-mannered? Perhaps. I get the logic. But seems to me that evidence is called for. I have yet to see any. And if anonymous are more likely to be ill-mannered, how much more likely? To the point where it would make sense to generalize, at all? I think not. I think that actually you can’t tell anything at all about a person commenting in the blogosphere on the basis of whether they’re commenting anonymously. Quite to the contrary, I think that it says something when people who putatively are concerned about careful analysis make very confident generalizations on the basis of someone’s anonymity – despite that they have nothing other than anecdotal and highly subjective reasoning to support their conjecture. In fact, the notion that you can judge a person on the basis of their blog comments, let alone the handle that they use, is specious, IMO. I think that the tendency to judge people on the basis ofblog comments is an unfortunately common fallacious form of reasoning that characterizes much of the blogsphere. It goes back to the very basic principle of confusing fact and opinion. Minority opinion. I like the name WottsUpWithThat. If only because the self proclaimed sceptics are not very sceptical and do not often venture out and learn about reality. With the current name, many people searching for WattsUp will get WottsUp as Google also takes misspellings into account. And it saves us the problem of finding a new name. Dr Civil? Could be the bad genius in a Bond movie. I’ve changed the name of the blog to And Then There’s Physics. If you would still like to comment on this post, you can do so here.